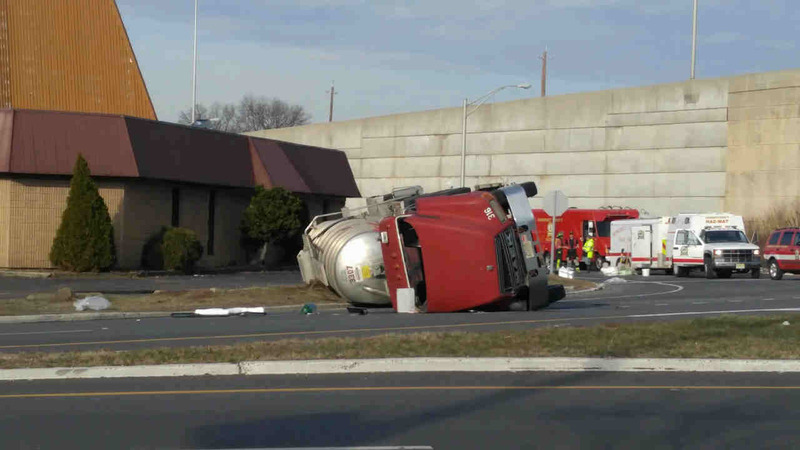 RARITAN, New Jersey (WABC) -- A tanker truck overturned in the Somerville Circle in Raritan Tuesday morning, prompting road closures and business evacuations. The crash was cleared Tuesday afternoon, and the Somerville Circle was re-opened. The tanker flipped at around 7:15 a.m. on Route 206 on the circle. It was the only vehicle involved, and the driver suffered only minor injuries. A total of three businesses were evacuated -- the Gateway Inn, the STS Tire and Auto Center and the Auto Image. The Somerville Shopping Center was closed, but not evacuated, so that traffic could be diverted through the parking lot. All police would say about the contents of the tanker is that it was a combustible liquid that was leaking. Somerset County HazMat teams worked to offload the material. The right lanes of Route 206 South into Raritan remained closed at 1 p.m. Access points to the Somerville Circle are open.